There has been a welcome addition to one of the original attractions in the Dells. In fact the original attraction dates all the way back to the mid 1950’s. 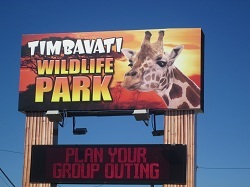 The owner of Storybook Gardens has added an entire new theme in the way of Timbavati Wildlife Park! By adding wild animals from all over the world they have created an entirely new attraction even more enjoyable for all age groups. Our visit really turned out to be an experience we’ll talk about for a long time. For several generations now, Storybook Gardens has provided both fun and educational entertainment to kids and adults of all ages. This was a chance for us to relive those childhood memories of the mid 1960‘s. We think you will find this a very nice way to spend time with your children or grandchildren too. It will be a day to create memories that will connect your past and their present. Actually, when you drive up to Timbavati Wildlife Park, you'll see a building, designed like a boat. A very large aqua colored boat. This, my friends, is the entrance to the park as well as an adorable gift shop. Just know...there is another whole world beyond the gift shop entrance and you will be amazed, entertained and educated all in one trip! As we entered the boat, we were greeted by a couple of young gals that answered questions and handle the ticket entrance. The entire building is filled with animal artifacts, T-shirts, and so many unique gifts associated with children, animals and storybooks. After looking around for a while, we made our way to the entrance of the park and into "the wild"! We happened to arrive just in time to see the amazing live animal show. Upon arrival, we just happened to bump into Mark, who we learned was the owner of the park and he suggested we make the show our first stop. I am sure glad we did because we were entertained beyond our expectations. This animal stage show is located under a shaded pavilion upon which we sat in bleachers and the animals were presented on a jungle type stage adorned with bamboo and plants. As we listened to soft animal music, we were quickly awed by a slow moving tortoise named Franklin, who took no time at all to walk the stage and down a ramp towards the crowd! Shortly after, we were greeted by Sweetie Pine, a porcupine and then Ollie the possum and an armadillo imported from Ghana. 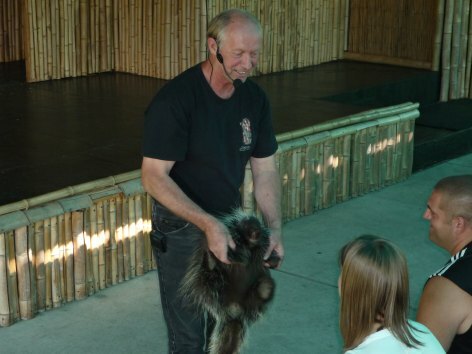 During this time, Mark, the owner, came out and introduced himself and gave us a world of information on these animals and their habitats. It was then that I realized that the owner of this business, Mark really does walk the walk and talk the talk! It was evident to us that he was passionate about his work! At one point, he asked for a volunteer (a young girl) from the crowd. She was to feel into this bag and describe the animal she was touching! She ended up revealing the cutest nine month old baby kangaroo, Skippy, who pleasured us with his presence. 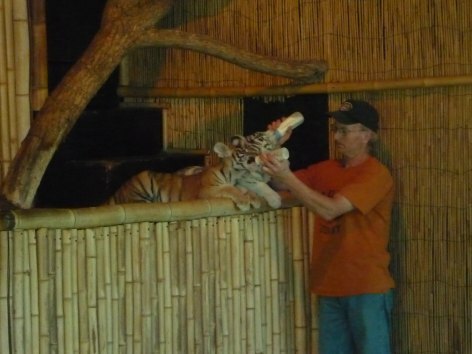 Towards the end of the show, two Bengal Tigers, only eleven weeks old, were fed by bottle and romped the stage. as it turns out, Timbavati Wildlife Park was named after Timbavati Africa, where the two baby tigers were from. The stage show ended with an option for kids and guests to have their photos taken with the animals. At this time, we started walking the gardens and shortly came upon a beautiful waterfall adorned with flowers and a cute bridge. After walking the bridge, we were soon in the heart of Storybook Gardens Land! Along the path of numerous storybooks that were featured such as Simple Simon, Jack and the Beanstalk and much more, you'll see many wild animals (protected of course!). In the center of the park is an adorable gingerbread snack house. Not too far from the snack house is a cute, and well equipped playground for little kids to run, jump and climb like monkeys! Speaking of monkeys, they have them! I had several highlights, like the animal show, but couldn't wait to get my photo taken with the Giraffes! 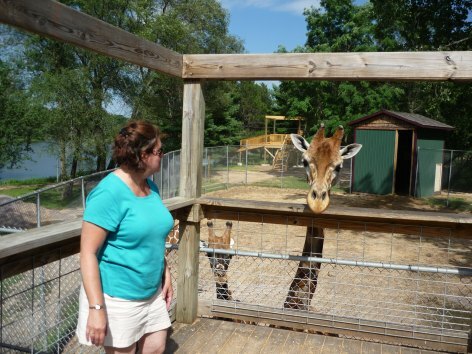 And yes, there is a walk up lookout that comes to the height of mama Giraffe, so you can feed her and her two babies and get up close and personal! It was delightful. We finished our day with a sweet train ride around the park. The same train ride on the same track we rode as kids.